With a smoky, chipotle taste, these Chipotle Bean Burritos will quickly become a family favorite dinner! They give you the protein you need, without the meat and they taste wonderful. 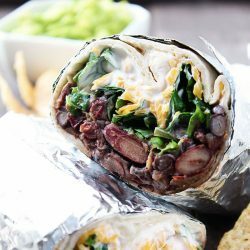 Before we get into things, I should probably warn you that these Chipotle Bean Burritos are not a copycat recipe for the burritos from the Chipotle restaurant. It may look like I was trying to be deceitful, but how else do you title a bean burrito with chipotle seasoning in it?! I hope this doesn’t deter you from staying though, because seriously, these burritos are incredible. This was one of the first recipes I pinned when Pinterest was just a little baby, many years ago. Zach and I were living a thousand miles away from home, I didn’t have a job, and we were doing our best to eat healthy and avoid any newlywed weight gain. (Oh, the good ol’ days when we had an indispensable amount of time to work out and meal plan. Ha!) 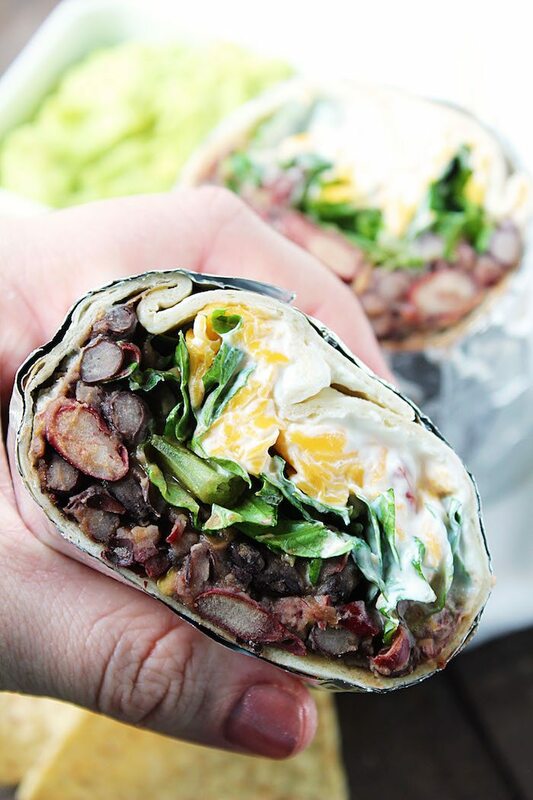 In walked these Chipotle Bean Burritos into our life and I have loved them ever since! Sometimes, I get sick of using meat to cook meals. Not to mention, it can get kind of pricey! These Chipotle Bean Burritos are perfect for when you’re on a budget and still want some protein. If I were a vegetarian, I could probably eat them every day. When we are doing really well in watching what we eat, we like to leave out the flour tortilla and just spoon the filling and toppings into lettuce leaves, to make some Mexican lettuce wraps! Either way, I hope you love them as much as we do! 6-8 flour tortillas Or for the calorie-conscious folks, use lettuce leaves and make them into lettuce wraps - one of our personal favs. Heat oil in a large, nonstick skillet over medium heat. Add garlic and cook one minute, stirring frequently. Stir in chile powder and salt - cook 30 seconds, stirring constantly. Stir in water and beans - bring to boil. Reduce heat and simmer 10 minutes or until thickened. Remove from heat and stir in salsa. Partially mash beans with a fork. Warm tortillas according to package directions. Spoon bean mixture into the center of each tortilla and top with your favorite toppings - roll up and enjoy. Mmmmm! Looks amazing! And I almost have all of the ingredients. These look delicious, on my must make list! Ok, this looks really good. And I love the smokiness of chipotle. I’ve never heard of chipotle powder, but I’m sure a good chipotle pepper or even some of the sauce would be a sure fit. Ummm. Oh my goodness, this looks so amazing! Thank you so much for sharing this idea, you cannot have enough ideas for bean burritos! ***Stopping by from the Creative Me hop, have a wonderful week. These look amazing and the title drew me in mainly because I love anything with Chipotle flavor! I can’t wait to try these! These sound so good!!! Will definitely be trying these! Love your blog! Love chipotle… and burritos. Will have to add to my to-do list. Those sound amazing! I’m definitely going to need to try this! Your burritos look amazing! Love the flavours! I’m sooooo going to make this! That looks delicious! We don’t have Chipotle over here in Australia so I will have to make this myself and see what I’m missing out on! If you have a minute to spare I’d be thrilled if you could link this post to my weekly Say G’day Saturday Party-this post is deliciously wonderful! These look so good! Just shared on our Google + and Facebook page! Have a great Sunday! yum yum yum- totally just pinned!! Yum yum yummy yum! I ADORE this recipe so much! I featured it in today’s linky! http://asouthernfairytale.com/2012/08/20/garlic-cheese-bread-with-fresh-rosemary/ Thank you for sharing it! 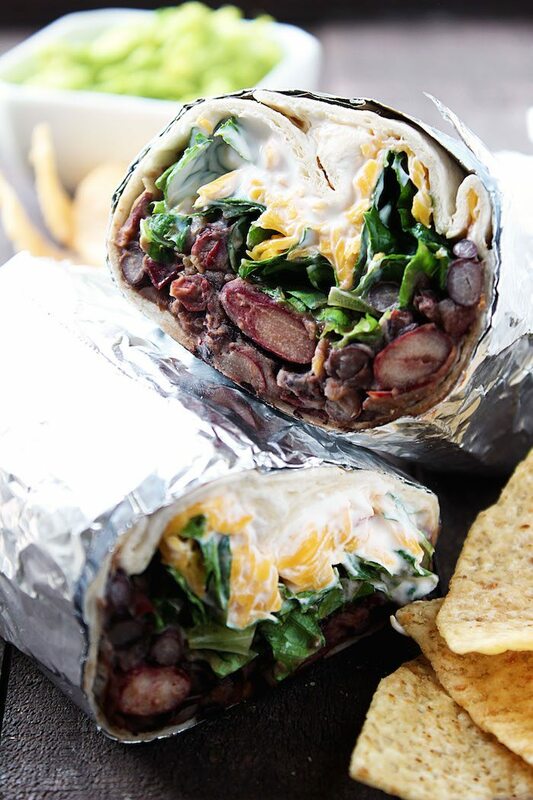 Thanks so much for linking these wonderful burritos to our Weekend Wonder link party! Stopping by to let you know that I featured them 🙂 Come grab a feature button if you’d like. Have a great day! I love bean burritos and this recipe is so light, can’t wait to make it!! I love this recipe! I can eat this year round and I don’t have to heat up my kitchen in the summer time. Definitely a keeper!